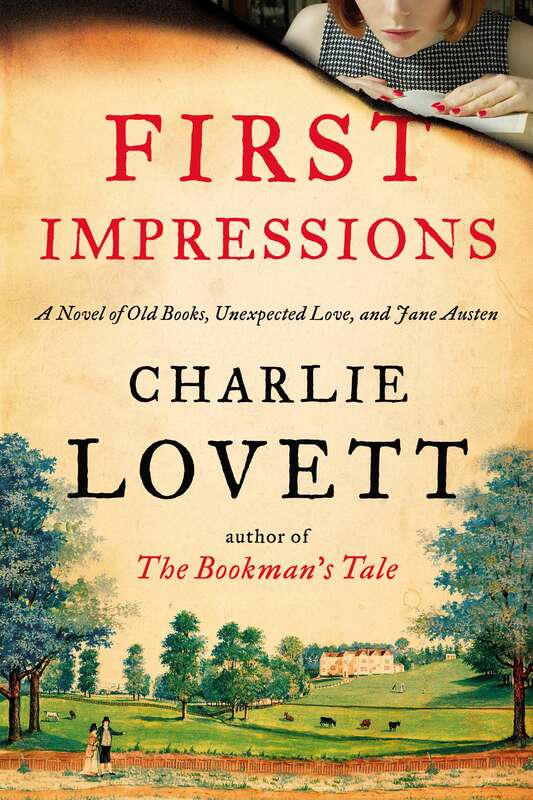 We all get excited when another Jane Austen spinoff is coming out, so you’ll understand why I’m on the edge of my seat for Charlie Lovett’s upcoming ‘First Impressions’. Set to be published in October, on the 16th, from Viking, the title obviously comes from Jane Austen’s “first draft” title of Pride and Prejudice – which obviously has bells ringing for any P&P fans in search of their next read. Charlie Lovett is the author of The Bookman’s Tale, which appears to be well-loved by online readers. I was emailed a copy of the cover with permission to share it today, the 5th, and I’m told that I will be able to get a review copy early so I can share my thoughts with you. All things going well, Lovett should also be answering questions for us about this book before the year is out – so let me know what you’d ask him given the chance. The book, subtitled ‘A Novel of Old Books, Unexpected Love, and Jane Austen’ ISBN: 978-0-525-42724-7, follows protagonist Sophie Collingwood – a book lover and Austen fanatic – who has started work at a London antiquarian bookshop. This set up already has me excited – dusty tomes and Jane Austen, are there any greater loves? Things get shaken up when two customers order the same largely-unknown title, which the blurb reveals is a second edition copy of Richard Mansfield’s Little Book of Allegories. The following tale apparently brings a mystery about Pride and Prejudice’s true author and will apparently “ultimately threaten Sophie’s life”. I’m expecting some sort of mystery/detective drama with some Regency historical facts thrown in. Not a bad mix, and not a common one either. Amazon is currently listing the 320 page book in hardback for $19.38 pre-order. We’re also told that this is a dual narrative, that spans between her “quest to uncover the truth” and choosing between two suitors, as well as Jane Austen’s friendship with the author of that second edition book. I hope it doesn’t span too much into the romantic. I have high hopes for this read. I want it to be bright, action filled, and different to the usual spin offs that have us constantly reading but far-too-often weary. I’m also excited to see another spin off from a male author, something sadly uncommon in the Austen fanfiction space. I have not yet read The Bookman’s Tale, a New York Times bestseller, although will endeavour to do so before reviewing this new book, however it appears that Lovett is no stranger to books about books, and books about literary authors (the past being heavy on the Shakespearean references it seems) and all the nuances of antiquarian bookshops. He used to be an antiquarian bookseller himself, and is an avid collector. With some luck, his skill in writing about these topics will set him apart from other writers who fall into writing about bookshops with little understanding as to how they truly work – weaving compelling but unbelievable stories. I really hope that his experience pushes this book above the rest of the pack. I also have this slightly nutty little hope that if this book goes well, he may consider writing Little Book of Allegories. What would you ask Lovett? What are your hopes from this book? Thoroughly enjoying his debut novel now. Just preordered this one too.